There’s life on the edge! I spent the morning in the studio doing hand sewing and listening to NPR. Sewing by hand is not my normal mode. I don’t use handwork in the body of my works or as added embellishments. The only hand work I do is attaching binding edges. So as I stitched and listened, I thought about the edges as a chance for creative decision-making.. Painters who work on cradled boards have discovered this. Once it became acceptable for gallery-hung works to display without a frame, painters began to use this space creatively. Some wrap the image around the edge. Some leave the edge a natural wood color or paint it white or black. It’s a nice way to tie a series together. For quilts, I generally use a strip binding edge, or strip binding combined with facing the quilt, and I try to do so creatively. Here’s one edge of the piece I was working on this morning. I painted this fabric strip to match other areas of the work. I attached it by machine, trimmed the seam allowance to ¼” edge, then turned the strip so that it would show on the face of the artwork. That’s the top. On the side, I turned the binding to the back so the cream color went off the artwork edge. I did not want this work to have a boxed-in look with a contrasting binding on four sides. Here is the lower right hand-corner. 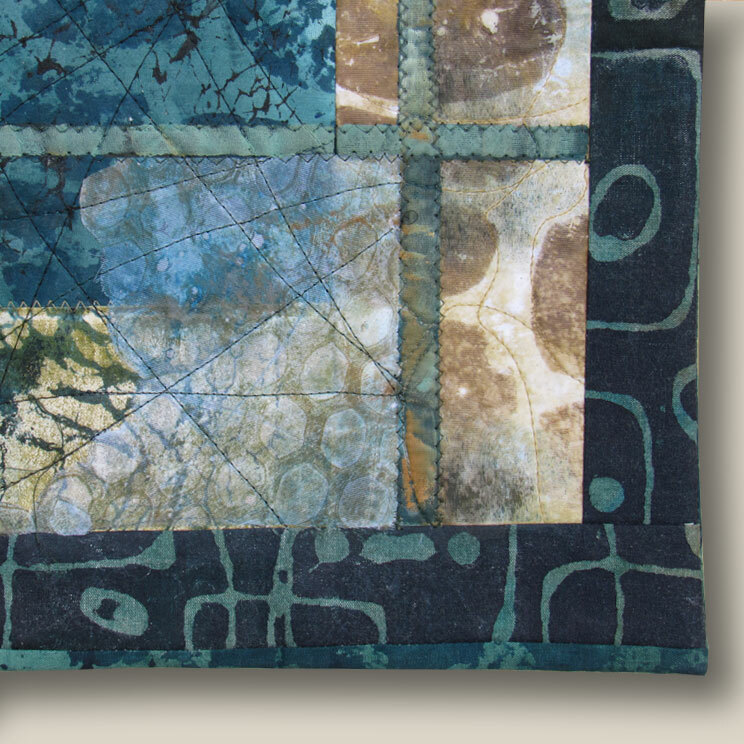 I have incorporated the black-teal fabric to function visually as a border in the lower corner, although it is actually a part of the face of the quilt. On the bottom edge, I have sewed on the binding strip so that it shows. I like the way this one looks on the wall. In “Every One Has a Different Story”, I added a visible binding on the bottom edge only. (I remembered this one as an example because it is currently hanging in my home, right above my computer screen. As I was typing I looked up and thought “Now there’s a good example!) The colored blocks along the bottom function almost as a sidewalk, and the strip anchors it. Now on to some new projects. I have about six sketches for new work ready to tackle. Hmmmmmm. Where to begin? You’ll hear from me by e-mail about once a month. Hieronymous Who? And where is he going? A work I co-created that addresses global warming is headed to an exhibit in Healdsburg, California. Here’s its story. I first met Hieronymous Bosch in art history class. I thought he was weird. Hieronymus Bosch WAS weird – or, certainly, the images he created were weird. He worked in the late 1400’s creating altarpieces and commissions for patrons, but filled them with mages that skewered civic leaders and church leaders. He also filled his works with contrasts: pastoral scenes next to surreal depictions of debauchery, licentiousness and vulgarity. 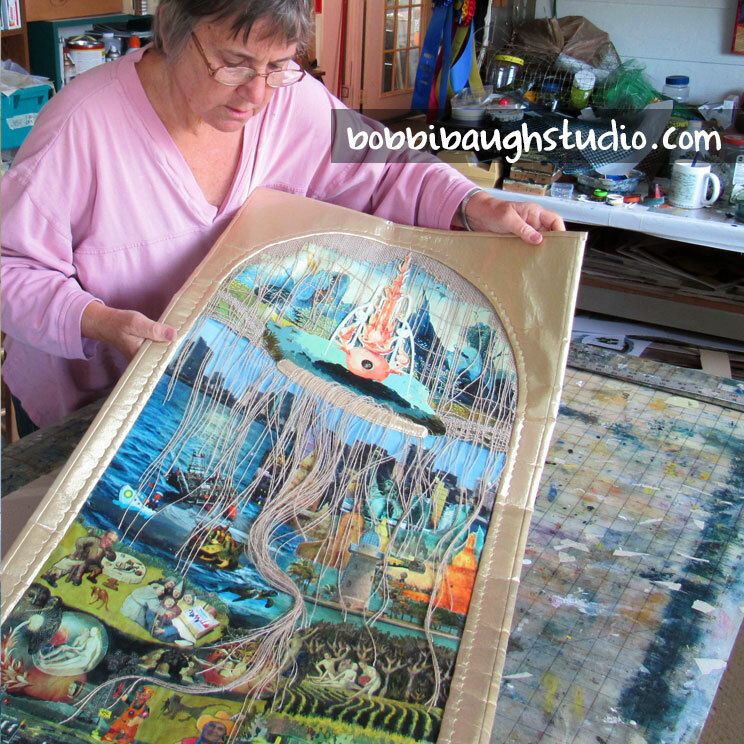 I met Hieronymous Bosch again in 2014 as part of the creative process for developing “End of Eden,” a textile artwork created in the form of an altarpiece. The work is a collaboration between myself and artist John Lewis, made to submit to SAQA’s exhibit, “Piecing Together a Changing Planet,” which traveled to 20 National Park welcome centers 2014-2016. We were pleased to have the work accepted and to keep track as it traveled to parks and was viewed by over two hundred thousand people. It is my firm conviction that the dangers of global warming are self-inflicted, the result of human folly, public policy that is unable to grapple with real events, and corporate greed. So, John and I wanted to make a piece that poked hard at leaders of all kinds and would provide viewers with food for thought. We looked to Bosch as our guide. 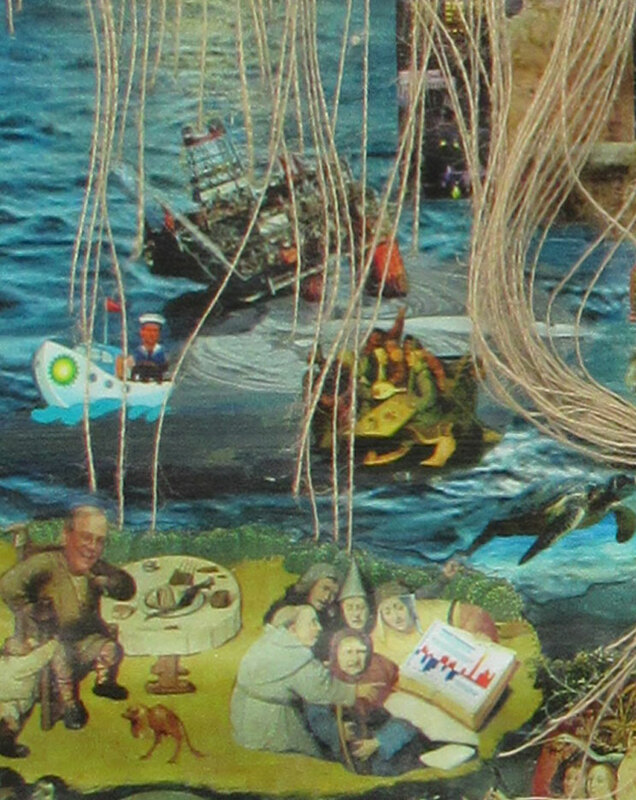 Detail “End of Eden”. We’ve added the CEO of BP and the oil spill to Bosch’s ship of fools segment, and translated one of Bosch’s gluttons into David Koch,. My recent body of work has been focused on inner stories and inner journeys. This is still important to me. But, neither I nor any other artist lives in a self-contained bubble. We’re part of the real world. I am pleased to be part of this work and part of this exhibit that asks artists to address a critical world issue. Bon voyage Hieronymous! Preparing End of Eden” for shipment to California. What else was there beyond the alley, beyond the neighborhood? What else was there to be? I was not taught to ask. I was not taught to wonder. I was not taught to dream. And so, asking, wondering, dreaming, and taking steps to follow my own path came to me late in life. But, hurray! I made it. I volunteer in a first grade classroom twice a week, and I look with wonder at each little child in my class. They are shining gems, little treasures of possibilities. I don’t know what kinds of homes or families they go home to each day. I can easily imagine the obstacles, hardships and inequities each of them will face as they grow. For each of them my hope is wider expectations, the ability to look, hope and dream beyond whatever smallness may define where they are now. A few years ago I created “Small Expectations.” I’ll just go ahead and admit that it’s one of my favorite works. I created the image of the two girls in the center, dressed in their go-to-Sunday-School dresses, from a family photo of myself and my sister. Behind the girls, I have created a background suggesting their diminished expectations. The words from a mid-twentieth century etiquette book fill the fabric behind them. The symbols of birds indicate the innocence of the girls. The alphabet border and ABC blocks give the work a feel of simplicity and elementary school lessons. Yet, these real and implied life instructions were serious business. For you, little girls… GREAT expectations! In 1987, Congress declared March as National Women's History Month in perpetuity. A special Presidential Proclamation is issued every year which honors the extraordinary achievements of American women. President Jimmy Carter's Message to the nation designated March 2-8, 1980 as National Women's History Week. Thanks for reading. I always enjoy receiving questions and comments. 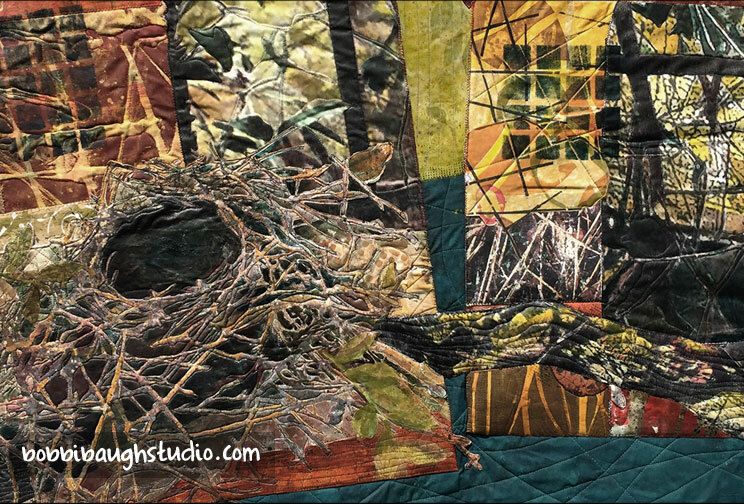 I recently put together a little video about the making of this art quilt. I believe that people appreciate a piece of artwork more when they know what goes into its creation. So, I have tried to address both the inspiration and the step-by-step process. The underlying structure of squares in tension with the overpainted trees. I remember that after I had printed and collaged all the individual squares, as I was laying them out in various patterns to finalize the composition, I almost didn’t go any further. I loved the squares. The colors were delicate and the patterns were interesting. I just wanted to look at them. But, at that stage the piece did not accomplish the emotional goal I had for it. There was no reason for a character to enter the scene if it was just pretty squares. So I proceeded to the overpainting and the final composition. Now, however, I know they are under there. It is one of the interesting aspects of creating textile works in sections. Even when the sections are not an obvious part of the final design, they are an underlying structure. They are in communication with, sometimes in tension with, whatever layers are on top. All of this adds depth and interest to the work, even when the viewer is not—at first—aware of their presence. I enjoyed sharing this work in person with visitors during my recent studio tour. I hope you enjoy watching the video. (The video should show below automatically. Making Connections... Does it Matter? In the first grade class where I volunteer, the teacher lavishes praise on students who make a connection. If the kids are reading about a figure from history in a non-fiction text, for example, and one points out a similarity to a fiction story they’ve read, that’s a good sign of putting ides together. This evening I’m thinking about some different recent connections. Over the weekend, I opened my studio to DeLand’s Annual “Off the Beaten Path” Art Studio Tour. What a great weekend. The two days were filled with conversations, and visitors having the chance to get a behind-the-scenes view of my artwork. 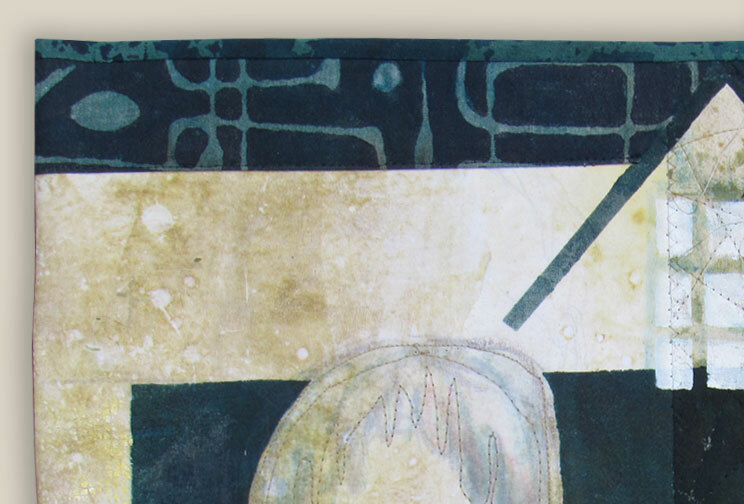 Touching a stack of printed yardage and seeing a brayer and a bottle of matte medium are everyday occurrences for me. 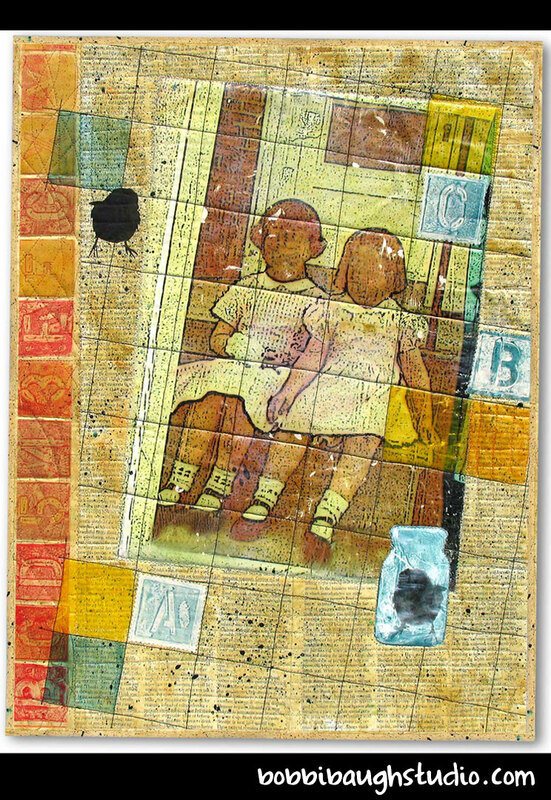 But, for the visitor, they are a way in to an understanding what textile collage is all about. When I first started showing my artwork locally, I was nervous about displaying and hoping to sell my work to people I knew. I thought they or I would be embarrassed, and that it was better to sell to strangers. Not true! During the tour, several of my visitors were members of SAQA (Studio Art Quilt Associates) and my local Surface Design Group, Arts. Etc. During those visits, we got to talk tech a bit. Being in a community of like-minded artmakers is essential! I enjoy the diverse methods and creative paths I’ve discovered from companionship with other artists. Some of my art buddies are my best encouragers. During the tour, the laundry room was converted into an art gallery when I set up my display panels. “Becoming One With The Night” greeted visitors into the laundry room gallery. Finally, I am learning that connections with people far away work too. I always enjoy the questions and comments I get from my blog and from website visitors. 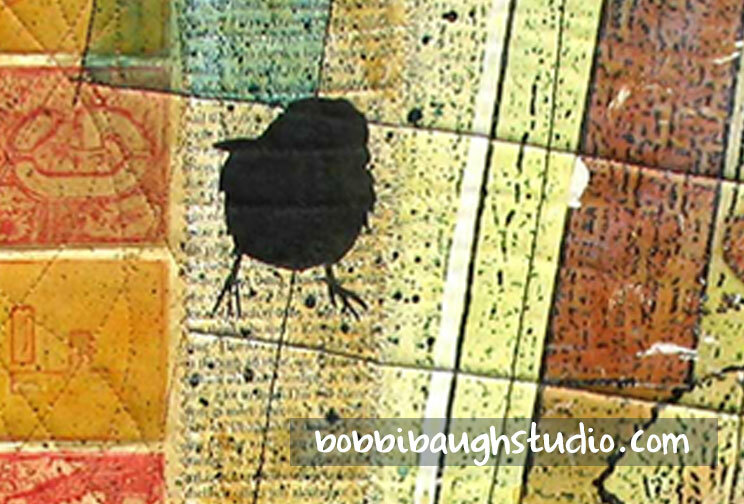 And, just today, I was featured in this article in TextileArtist.Org. I was honored when they asked me to do the interview, and pleased with the presentation they put together. Already I’ve had some nice e-mail correspondence with some of their readers. But yesterday was a day for sculpture and learning. Second: that we actually have a well-established and interesting public sculpture program in DeLand, Florida to visit — a tribute to our City government’s support, an active museum committee and lots of volunteers and supporters. As we walked from sculpture to sculpture, I hoped to fill the rainy adventure with a few art take-aways. When you walk up to a sculpture, or any artwork, and it doesn’t immediately resonate or speak to you, how do you respond? I believe people sometimes feel intimidated by viewing work in a Museum. If it’s there you figure it must have some value. But what if you don’t get it – or don’t like it? Out on a sidewalk art feels more accessible. So, at each step, our group talked through a 3-step process. Step 1: Just react with your gut. Some works are an immediate “Yes! I love this!” Some are works are a “Hmmmm, I’m just not getting anything from this.” And some are a “No. I have an immediate negative reaction to this work.” Any of those initial gut responses is acceptable and permissible. One of the sculptures in downtown DeLand: “Continuacion” by Jiminez Deredia. Its massive form is evident next to a City worker during the installation. Step 2: Try naming the elements. Elements of design are found in varying degrees in all artwork. Color. Line. Shape. Volume. Positive-and-negative space. Values. Direction. Rhythm. Pattern. Working your way through an artwork, looking for these things and identifying them, is a way to become more involved with the work beyond the initial response. A few times on our walk there were some “Aha” moments. “Look at that line, how it goes up on a curve. I wonder why the artist did that?” Asking the questions and wondering about the answers can help a work start to make more sense. Step 3: Find out what you can from the artist’s statement or other resources. Even the title of a work can add insight. Knowing that an artist was once a biology teacher, for example, might explain a work’s relationship with nature. Descriptions of materials and methods help too. Imagine the experience of carving marble. Or imagine the process of welding steel pieces. All this background information can deepen the understanding of a work. On our tour we had a few “Hmmm I’m not sure” reactions go up to a “Yes!” after reacting more with the work. (We didn’t get much change on the “No” reaction.) All OK. I enjoy living in a City where our downtown allows the chance to interact with art. Now it’s back to the studio for me. This is Bobbi with another sculpture from downtown DeLand: Three Point One” by Alex Mendez. This photo was taken on a nice sunny evening during the opening event, when the work had just been installed. 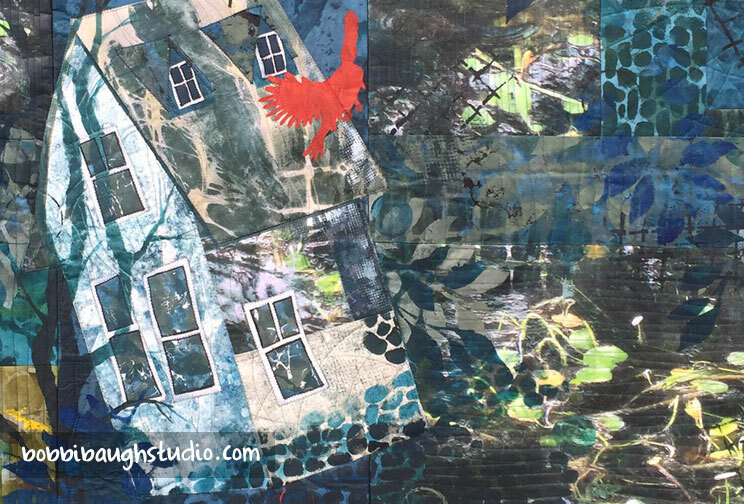 I am beginning a new series of art quilts and I am thinking about windows, working out compositions in my sketchbook. I discovered the appeal of windows as I created my “Home” series in 2018. Almost all of the works incorporated a shape of a house. But, as the series developed, I also became increasingly interested in the windows. A window invites one to look inside. A window may reveal, or it may obscure the interior. I like the rhythm of panes in windows. So, as I am looking ahead, I want to draw on what I am discovering about windows, and see if I can take it further or explore in some new ways. To get my thoughts rolling, I’ve been studying windows that I’ve discovered in the works of master artists to see what I can learn. Here are four I’ve noted in my sketchbook. Windows as Depth– This is “Spring Fed” (painted in 1967) by Andrew Wyeth. (1917-2009) The subject matter is sparse and the colors are muted. The first place my eyes go is the darkness of the water and the trough. Then that vertical black shadow in the water leads up to the vertical center of the window. Once at the window, I look through to the next room, and then through the smaller window and out beyond the wall to the animals in the yard. The window is the way into the journey beyond the foreground. Windows as storytelling device - This is “Night Window” (1928) by Edward Hopper. (1882-1967) (One of my favorite artists.) 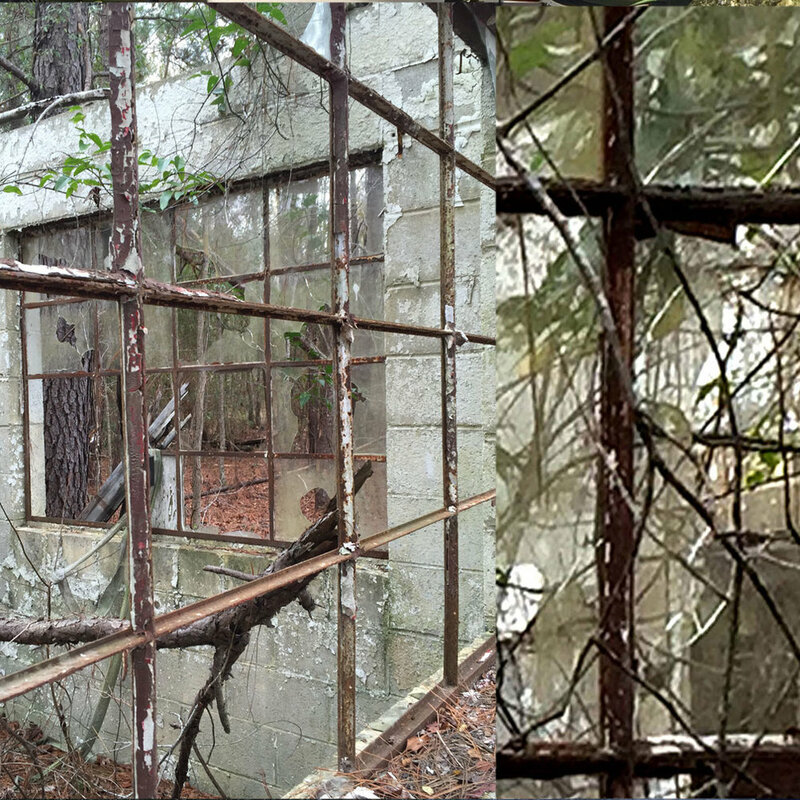 The windows are interior frames, revealing or suggesting a story within. The overall painting is dark, but inside the windows is light. The windows reveal the breeze, with the single curtain blowing through the window. And, of course, there’s the very intriguing backside of a woman revealed. Windows as balance – This is “Cottage Interior with Woodburning Stove and Geraniums on the Windowsill” by Andrew Wyeth. Wyeth’s seemingly simple depictions of interiors sometimes just take my breath away. This one has a very strong emotional pull to me. The only character is the woman, but she is all the way over on the edge of the picture frame and partially hidden. Balancing her, all the way over on the other side of the image, the light-filled window is a contrast. I find myself going back and forth between them: left to the woman, right to the sunny window, then back over to the woman. They balance one another and provide a dynamic quality to this very quiet, immobile interior scene. For me, the process of developing an idea may proceed on a different route for each concept. I like the windows element in my work. I’m hoping a combination of looking at others’ works and sketching out my own ideas will lead to a body of work that accomplishes what I envision. Stay tuned. I’ll keep working on this idea and write as I go. I’ve been thinking about water, and about incorporating more water images into a new body of work. Over the holidays, I took a photo-shooting walk in a beautiful preserve near my home to capture images. My goal was a group of shots for transfer to fabric. I was amazed, first, at the richness of imagery available in just the smallest bodies of water. Almost puddles, small ditches beside the walking path held wonderful surprises – colors, reflections, a sense of depth. In one spot, the water had a current. What a difference! I am still amazed when I look at these pictures. They look like molten glass, or like I have applied some PhotoShop effect to the image. This is just the delightful, amazing look of water in motion. And I was surprised by the number of pictures I shot that will not work for my intended purpose at all. When I stood directly over the water, looking straight through it to grasses and leaves at the bottom of the ditch, the water was so clear that in the photo it became invisible. These are interesting natural textures, but they do not look like water. When images of water are captured with some motion and bit of angle, they are – to me – just magical. They make me want to stop, to see in, to wonder about what is going on below the surface. Water in movement is a wonderful thought-provoking addition to works where I want to urge the viewer to look more deeply. “Sometimes You Can’t See In” art quilt. Water detail. The whole quilt can be seen on my web site HERE. The rhythm of printmaking by hand lends itself to contemplation. Once I am in printing mode, I find that I am both working with my hands and going elsewhere inside. December 23 was a printmaking morning for me, and also a day of thinking. Thirty two years ago on that day my daughter was born. How has that passage of time and the accumulation of experience and memory occurred? I do not write this in the sense of, “Wow! Time sure does fly!” That, of course, is something we all experience. I am wondering about the mechanism of memory and time. Are there specific cells in my brain which hold specific pictures and sounds? As all of our body cells are dying and recreating constantly, how, then, do we retain those memories? Where are they? Thirty two years ago my daughter was a wonderful new being — warm, squirming, fascinating, and, as I realized I actually knew nothing about babies, a little terrifying. Today she is a warm and wonderful young woman. Such transformation, such experiences. I take my artmaking seriously. I believe I am doing my best, most interesting and most meaningful work when it digs at least a little below surface and aesthetic considerations and touches meanings or memory and experience. Each of us, when we create, is bringing to the work all that we are, all that we know, and all that we don’t know. Can my work be both visually compelling and thought-provoking? Can I create work that touches memory and experience in another person? Does the work need representational subject matter to do that? Can abstract forms and colors communicate as well? The unfolding and continuing of this second question is what keeps me interested. Acrylics on my worktable: I set out the colors I plan to use for the prints. I love these quart jars of acrylic paints with the nice wide, easy-access lids. Several years ago an artist friend told me about Nova Color paints from California. I have been using them since, and they are also my primary source for matte medium and gel medium. (I buy these by the gallon.) I limit my palette of colors kept on-hand and mix all my printing colors from these basics. Printing plate: I print by hand from a soft gelatin plate. The plate I am using currently is in a commercial size cookie sheet about 18” x 22”. I mix my own, and use a recipe with glycerin so it does not have to be refrigerated. I have been using this one nearly a year. I also have a commercial gelatin plate I use when I want to have two going at once. Each has its own quirks, and you have to experiment with amount of liquid needed and amount of pressure. Materials: Generally, I print on muslin, sheer polyester fabric (shown) and rice paper. The more delicate printing materials (the polyester and the rice paper) pick up more nuance and delicate image from the plate. The muslin will print with a more opaque appearance. Hands on! I use my hands to press stencils and relief materials on the plate and then press my printing surface into the paint. Yes, my hands get pretty messy. But I’ve tried gloves and just don’t like working that way. Here are a few of the images I created this morning. I’ll be incorporating these into a new art quilt. Thanks for reading. I always enjoy questions and comments. ART. NOT ART. Does it matter? I had a wonderful opportunity to be the presenter this weekend for a SAQA (Studio Art Quilt Associates) group in Melbourne, Florida. We spent time thinking through the difference between — 1. ART, and 2. NOT ART. Is there a difference, and does it matter? This is an image from a cave painting at Lascaux, France, which may have been created as early as 20,000 BC. This is ART. No question. And not because it evidences a lot of technical mastery or sophisticated materials. It is art because it has a specific expressive, communicative intent. This MEANS something. When I read descriptions of how hard it was to get down into the caves, how small the space, and I imagine a prehistoric person intentionally doing so for whatever ritualistic purpose this represented, I am in awe. It may have been considered magic. Or it may have been a rite of passage. But these were not created lightly or haphazardly. They have a meaning. Sample decorative accessories from a major merchandiser. These images represent mass-produced decorating accessories shoppers can find almost anywhere. They are NOT ART. That does not necessarily mean they are ugly, or that one might not enjoy using them for decor in a home. But even the original illustration that was done in order to manufacture these did not hold personal meaning in any way like the paintings on the cave wall. This is graphic design on-assignment. I spent many years in my professional career working in commercial printing. I have created graphic design on-assignment. I have been involved in its production. It is not an evil or demeaning endeavor. But it is also not art. In our time together this weekend, the group of textile artists gathered worked to think through the importance of original intent. And the process of developing a voice that is singular. And what techniques we can use to get beyond the creative traps that make us produce work that’s less than what we had hoped to create. We discussed the importance of all that happens before a specific work is even started. We concluded that there is ART. There is NOT ART. They are not the same. And it matters which you are creating. When I create my own artwork, it is my hope that I’ve done enough up-front work to make the piece meaningful. 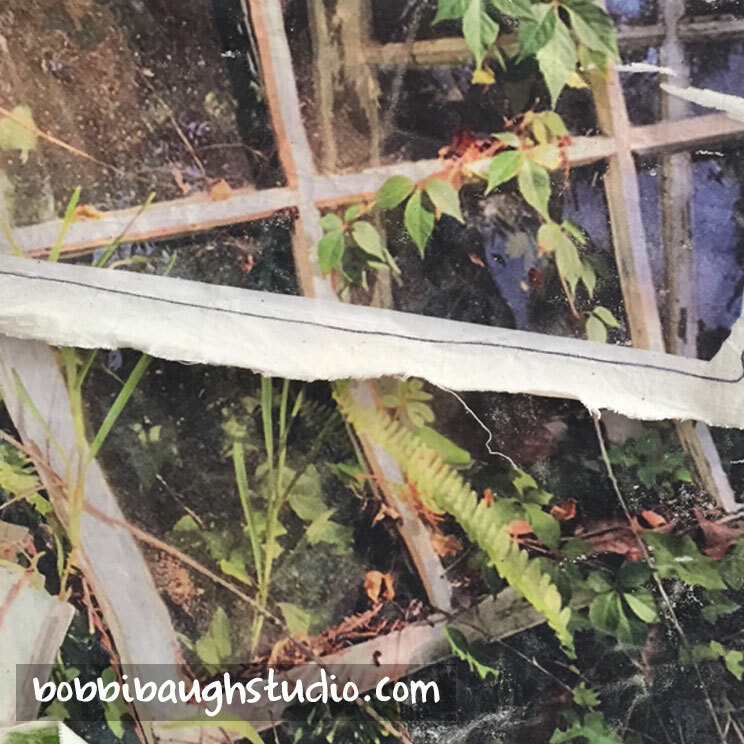 I want to have worked through what it is I am trying to communicate, and then use the studio time and the techniques at my disposal to accomplish the vision. When a collector brings a work into a home, it is my hope that there is enough that’s interesting, personal and layered to provide new things to discover for a long time. For me, that’s the fulfillment of the time, thought and emotion that I put into my work. Looking through my studio files today I found myself looking at this work. This is where life started for me and it’s the place of my earliest memories: a neighborhood of row houses in Baltimore. My family lived there from the time I was born till I entered second grade. For those who have not lived in row house cities — Baltimore, Philadelphia, Boston or others throughout the country — the neighborhood may need some explanation. It is not a tenement or slum. It is not a fancy affluent neighborhood of Brownstones or Townhouses. It’s just a family neighborhood. Each block has six to eight houses with no space between them, and then there will be one “end house” that has a side yard and a little bigger back yard. All the houses have street parking out front, no garage, and a small fenced back yard with a gate leading to the alley. The alley is where kids ride bikes and play ball. 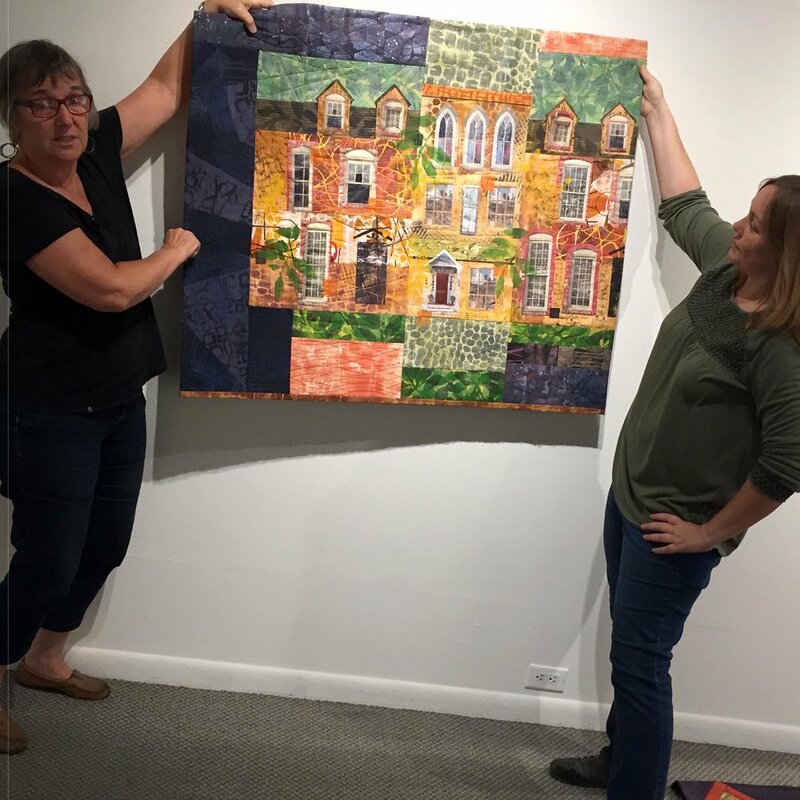 As I worked to capture memories of home in my artmaking this past year, recreating the feeling of a row house neighborhood in fabric seemed like a good fit. 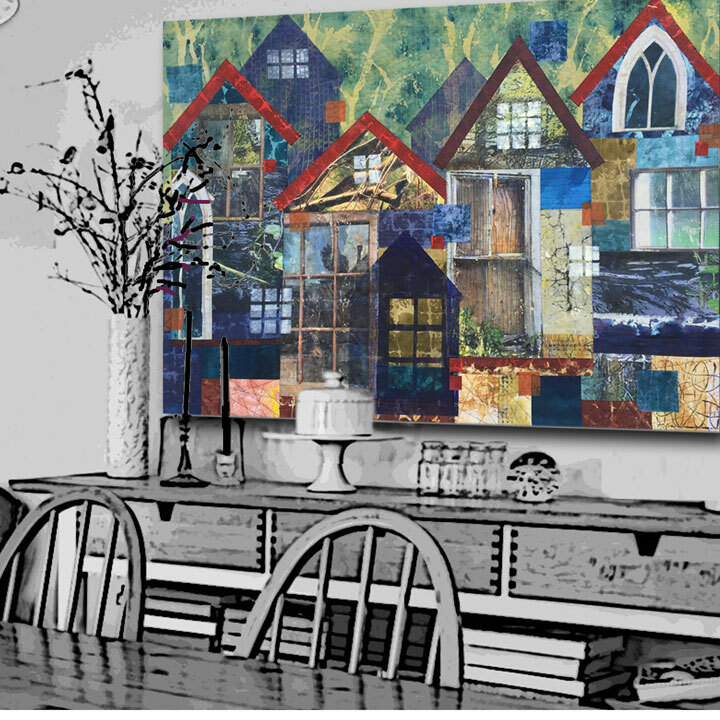 I had printed a number of fabric pieces with lively colors and patterns, and they spoke to me of the varied lives and stories inside each home. 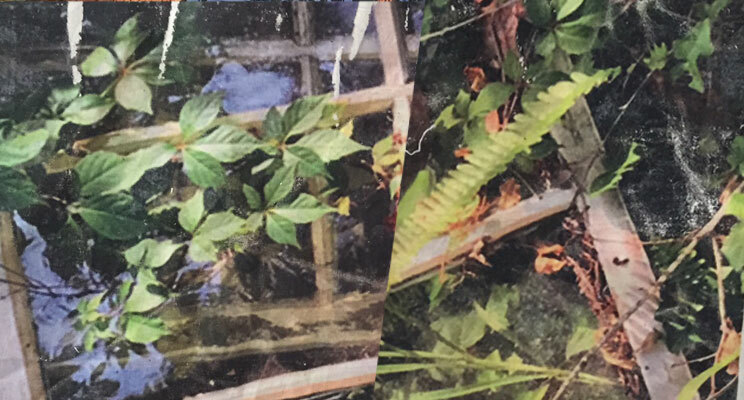 I also created photo transfers of actual windows onto muslin, and I liked the mix of the photographic reality with the printed fabric. I added the suggestion of leaves and trees. I’ve done a little more on my chair project to be auctioned at an event in January. (Chair creations by local artists will be a fundraiser for public arts projects here in DeLand.) Today I started some structural fixes. The seat had been cracked and glued back together. Extra reinforcement seems like a good idea. So I’ve sanded the bottom, cut a piece of plywood to fit the bottom, and will glue and screw it in place. I will probably cover all this with felt. Next: Beginning the fabric printing of the upholstery. A Journey into Memory. Then Waffles. And an Exhibition. This evening I’ll be standing in a beautiful gallery with my artwork filling the walls, watching visitors and patrons and engaging in conversation abut the work. It’s what artists work for, and it represents a year of creating this particular body of work. So we started the day with waffles. Blueberry. And bacon. I am thinking of the many stages in the process. I loved the side-of-the-road inspiration in rural South Carolina where I stopped, stood in the quiet of pines and looked into the heart of a small abandoned house. Its insides were filled with vines and saplings. The roof was gone. The door was rusted and peeling. It provided a strong inspiration for me for the body of work about HOME. I took photos. Those photos are actually transferred into the fabric that I used in several works. I am thinking of the memories of my own childhood homes, and what it took to look deliberately at those memories and to make sense of the stories. Every artist draws on their own story, and I have drawn deeply from my own. But, I am not a fiction writer nor am I creating an autobiography. I have worked to translate personal story into interesting and thought-provoking images that will speak to patrons with all kinds of backgrounds. When a piece of my art is invited into someone’s home, I hope for it to provide new meaning and something new to see for a long time. I am thinking about all the logistics and practical aspects of creating a body of work. I started twelve months ago with a schedule and a series of sketches. I have addressed storage, transportation and shipping issues, and all the hands-on work of creating the pieces. Now it’s there, on the walls. The waffles are gone, but I still have an invitation to offer. 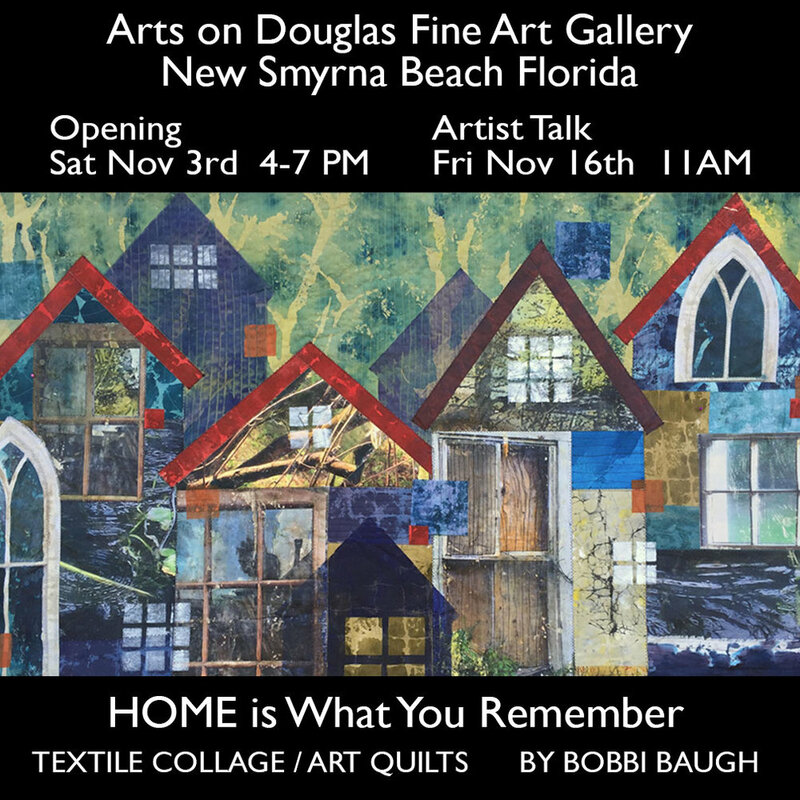 Please visit Arts on Douglas Gallery in New Smyrna Beach to view “HOME is What You Remember.” If you are not in Central Florida, I hope you will enjoy a visit to the gallery of these works on my web site, HERE. Some in-the-works and sneak peeks below. I’m ready.